Location: 2120 S. Laredo St.
​End Barrio Warfare has been painted twice, in 1998 and 2011. Although the two versions of the mural appear with different images on different walls, both address the tragedy of barrio violence and the Westside community’s ability to overcome it with peace. Nineteen-year-old John Montez lead the restoration of End Barrio Warfare, spearheading a group of young artists from Lanier High School and the Bexar County Juvenile Justice Department. As a former participant in gang-related tagging and violence, Montez found a positive way to make his mark in the community through muralismo. 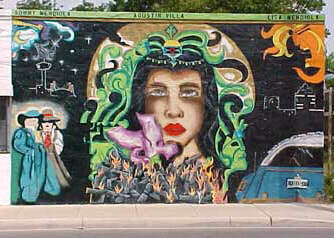 In the original mural, artists Agustin “Fugi” Villa, Lisa Mendiola, and Sonny Mendiola used pachuco and zoot suit imagery “to remind generations of the past and the importance of peace, love, and non-violence.” The original mural had an Aztec-styled goddess speaking peace over the City of San Antonio in the top right corner, with an Aztec-styled warrior raging on the right. The bottom left corner was a picture of a couple in zoot suits and the bottom right was a lowrider. As in the restored mural, the central image is a portrait of a woman. In the original mural, this woman was a pachuca with the crown of an Aztec princess, standing in front of the moon with an orchid and a blazing fire in front of her. Community Mural Program (CMP) Coordinator Ruth Buentello and Muralist in Training John Montez redesigned End Barrio Warfare to reach a contemporary audience. The restored mural still features a central portrait, incorporates Aztec imagery, and addresses the issue of barrio violence, but is otherwise a completely new mural. The woman in the center was modeled by Adela Arellano, whose portrait is placed in front of the Aztec calendar. Directly beneath her, Enrico Salinas modeled as a gangster with a “210” area code tattoo breaking a gun in half. To the right, Montez poses with Amanda Guerra, representing the grief caused by violence. In the left of the mural, WARD (street name), GOES (street name), and Montez pose with clasped hands and raised fists to representing triumphing over violence. The San Antonio skyline runs along the bottom of the mural. The bright pink-purple and yellow background of the mural pops in the otherwise monochromatic industrial area. End Barrio Warfare was originally painted on the same building as Educacion, at the corner of Guadalupe and Chupaderas. 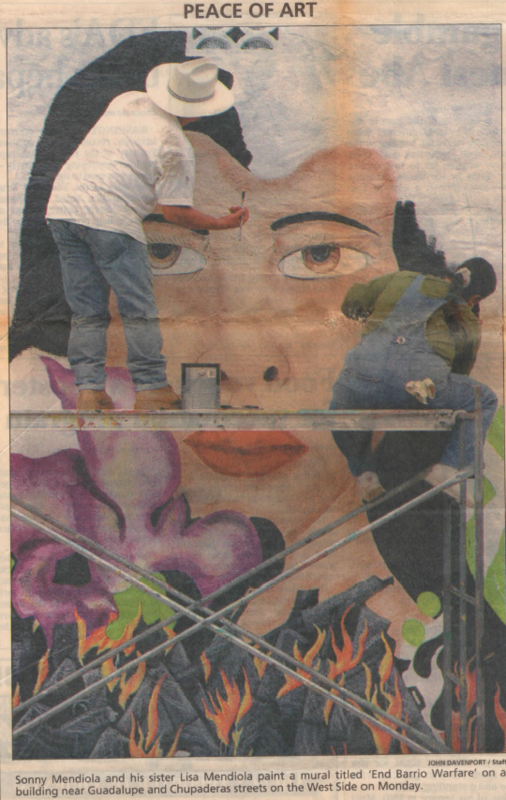 Because EBW was an early mural, San Anto Cultural Arts had not yet discovered the best materials to use for outdoor murals. After a few years, the mural began to peel and chip. Unusual for barrio murals, the piece was also tagged. Repainting the mural would have been difficult because the wall itself had also been damaged over time, with cracks and protruding pipes that would have to be fixed before the mural could be restored. When Ruth Buentello became the coordinator for San Anto’s Community Mural Program (CMP), she decided to restore EBW on a new wall at El Rinconcito Taqueria. Buentello hired 19-year-old John Montez, a local graffiti artist, as Muralist in Training for this project. As Muralist in Training, Montez worked under Buentello for the first half of the project and transitioned into becoming lead artist for the second half. The program was designed to develop new artists. As a Westside native who had experienced barrio violence, Montez was passionate about the project and brought some of his friends into the project, including the two who pose next to him with raised fists on the left side of the mural. When the mural was finished, the owners of El Rinconcito repainted the entire building to match the painting. Because El Rinconcito is close to Lanier High School, San Anto Cultural Arts partnered with Abigail Grass’ art class to recruit student artists and volunteers. The Bexar County Juvenile Justice Department also granted two youth from the community permission to complete their service hours through the mural project. The youth worked together at Inner City Development to design, draw, and paint the mural on polytab cloth. Nearly 100 people attended the mural blessing on January 22, 2011. The mural was blessed by Father Marty Elsner of Our Lady of Guadalupe Church, who also blessed the original version of End Barrio Warfare. Growing up I‘ve always had a hand for art. I knew it would stick with me forever. During class trip my 12th grade year at Frank Tejeda High school visited. San Anto Cultural Arts. Little did I know how much of an inspiration that day would have been. On the day of the trip we met a mural coordinator by the name of Ruth Buentello who educated us on the murals we saw that day. She informed us about the history of San Anto Cultural Arts, how the murals were created and how much of an inspiration they are to the community. From that day it changed my whole perspective of art. I volunteered five months straight before I was given the chance to become part of san Anto Cultural Arts. Becoming a mural apprentice I would have to say on of the exciting things to happen in my life. Being able to learn new techniques such as using Photoshop to design a mural and painting on parachute cloth which I was never familiar with. Being given this opportunity to be a lead muralist on this mural has been such a wonderful experience and has made me realize nothing is impossible. Being given the chance to influence people through art but also sending a message is a great opportunity.